from exhibition, graphic design to architecture related work. If you want something to be seen, it must first be noticed! That's exactly what the product series Notiz for Lundqvist Inredningar is about – clear, efficient and functional exposure that captures the eye's interest. Notiz is a display system that stores and exposes – magazines, books, newspapers and brochures of various sizes and thicknesses – in a visually attractive way. V-shaped compartments, which resemble the shape of an envelope, offer efficient storage that also visualizes its content. Material strapped behind elastic cords, that runs in a zigzag pattern, gets the clearest possible exposure. Both the V-shape and the diagonal direction of the cord ensure that all types of printed matter do not fold or fall forward. 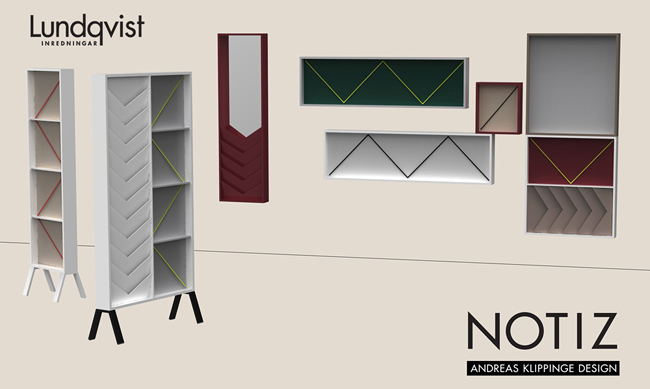 In addition to storage, Notiz also features functions such as magnetic glass writing boards, pinboards, mirrors and an office post/message shelf. The system is wall mounted or free-standing and available in a variety of combinations and sizes, that function both as single units or combined into systems with multiple modules. Discover new compositions by turning and twisting, and make Notiz match different interior design projects by your own use of colors and selection of materials. 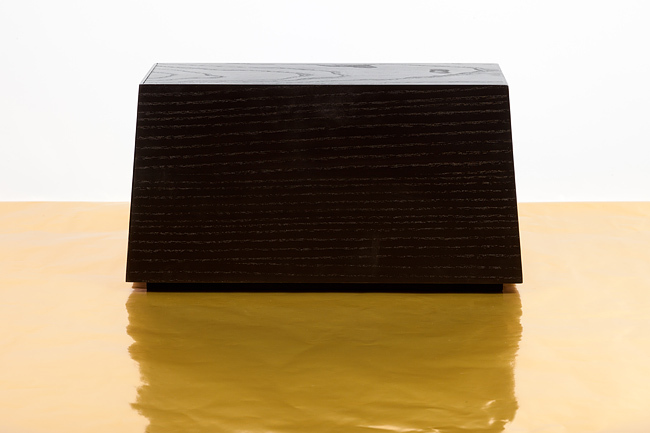 Ö-land draws inspiration from the archipelago of the province of Småland's coast. I grew up there and just over the Kalmar strait you will find the unique limestone slopes and cliffs on the island of Öland's northwestern side. For what are tables if not like islands something solid to anchor at? Not least when we cruise through everyday life – from island to island following demands and needs. advanced CNC-millings. 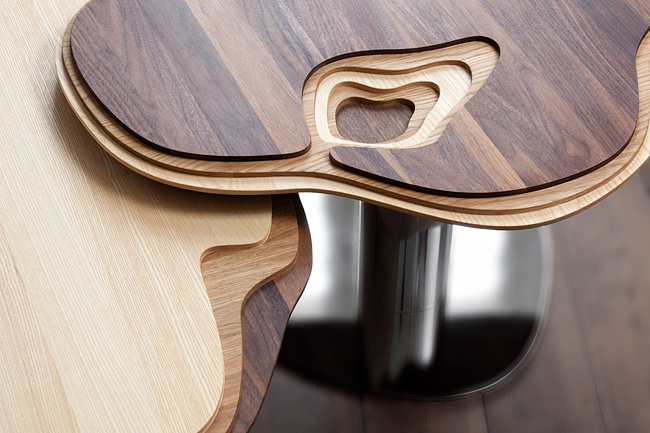 The color difference between the wood species enhances the landscape formation and the chromed table stand is reminiscent of a mirror-like water surface. The set of low tables was created for of the exhibition Den Nya Kartan/The New Map at the art and design museum Vandalorum, in close collaboration with the table-top manufacturer Ljungsåsa AB. Kompis is the Swedish word for friend – simple to understand and trust. By its gentle design, durablity and also being easy on the wallet, Kompis wants to be everyone's friend! Friendly, simple and easy to like – painted in Lappset Sport colours! The Living Colours palette combines natural tones with relaxed and vibrant colours. The design is the structure / the structure is the design – as clear, uncluttered and user friendly as possible. The characteristic curve of the steel tube provides a soft enveloping feeling, that derives its origin from the wing chair. The curvy tube serves as an accessibility adapted armrest/support when sitting down and getting up. Lots of floral joy fits in Arkad, or even a cactus or a tree! The planter is perceived as soft by its arched sides and leaves the ground through an arch shape, giving the vessels a light impression. Arkad ships in flat packages and is assembled by a simple installation, the planters are also stackable and can be ordered in almost any colour you'd like! 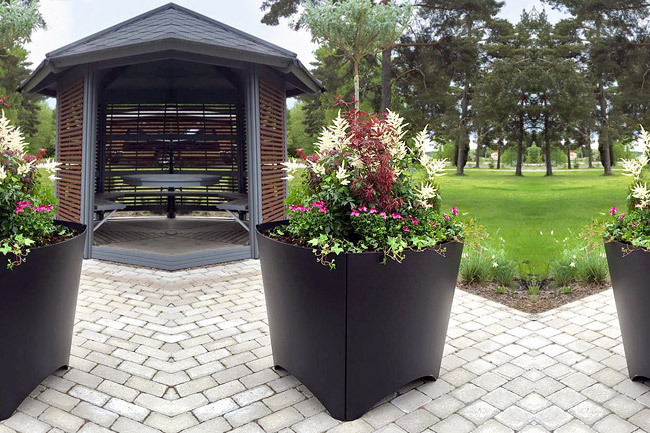 Arkad planters are made of laser cut steel sheets, that through a modular design can vary its size and shape according to number of sides (3-triangle, 4-square, 5-pentagon) or by adding straight sections. Arkad can be lifted using lifting straps that attach in shackles, which are hidden by the soil on the insides of the planters. The opening at the bottom makes the planter easy to move with a pallet truck or forklift. Choice, adaptability and an expandable product family formed the basis of the Nifo furniture series. Nifo's simple arch design has many qualities such as being production efficient, soft and inviting, and make it easier for water to drain. The armrests are very important for the series, purely functional but also for the expression. Besides the most obvious feature, as something nice to rest your arm on, the armrests are ergonomically designed. Offering an easy to grip end that is positioned high up and far forward, to be used as a brace when getting up and giving support all the way up to standing. The knob, at the end of the armrest, prevents you from accidentally slipping your hand. It is also designed to hang things on – backpack, shopping bag, purse, etc – instead of putting things on the seat, which then prevent other people from settling down. Nifo's arch shape is the result of a sitting comfort primarily considering elderly people and children, yet suiting us all. 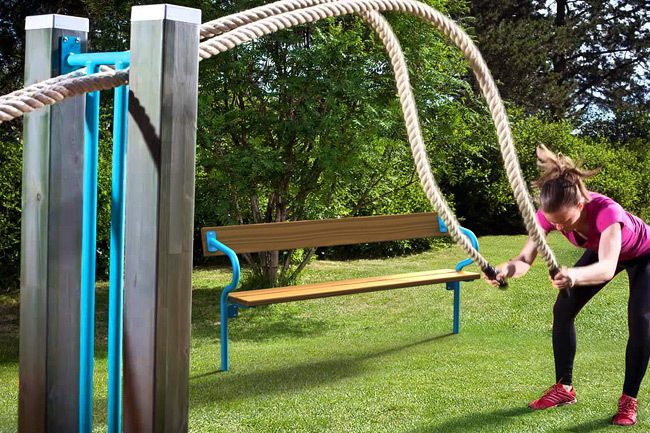 The arches form a more upright sitting curve, that makes it easy to get up and down, provides support all the way down to the lumbar region and allows itself to be followed by the short backs and legs of children. AKD has been part of a rural development project – commissioned by an entrepreneurial research project at the Linnaeus University. AKD was involved in the investigation of the local conditions in the district of Älmeboda, in Småland, by creating venues around the lake Rävsjön. With my design I want to unite the area around the lake and create platforms that bring people together. 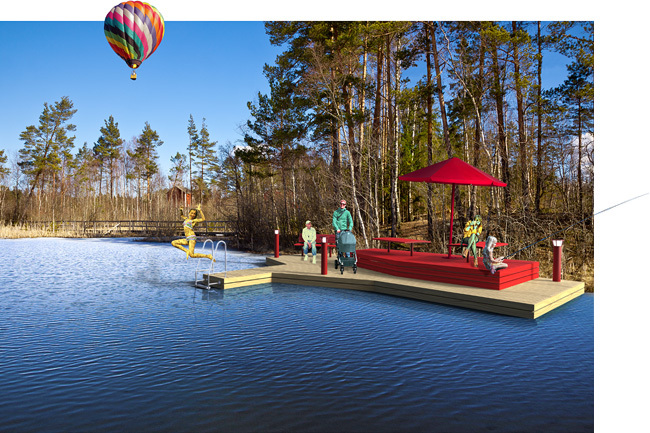 The concepts includes sauna, walking/jogging trail, picnic area and bathing jetty – which came about through discussions with the local residents and their own wishes of developing the area and their community. The monochromatic use of the red color is what binds the different venues together, get the area to stand out and attract visitors, while the red shade also is well-known and typical for cottages and barns in the province of Småland. 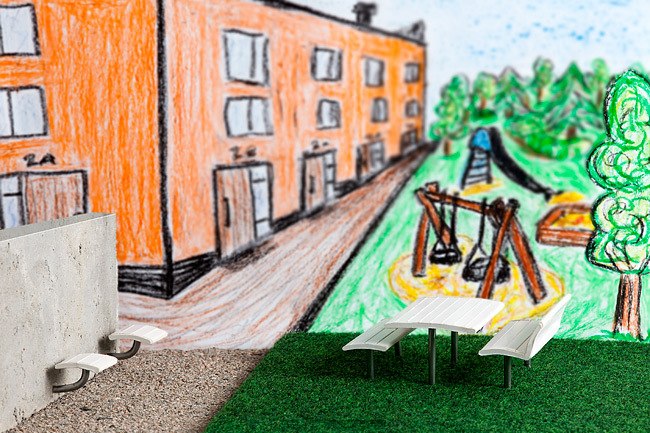 The project also features products from my park and street furniture series NIFO for LAPPSET. My idea was not to create a competitor to other wood flooring. Rather to create a floor that primarily may complement it and focus on the rooms and areas where customers are more inclined to exclude wood in favor of a different flooring material. a whole. The customer recognizes the floor's both patterns and makes a positive association with other hard and durable floor and wall surfaces. 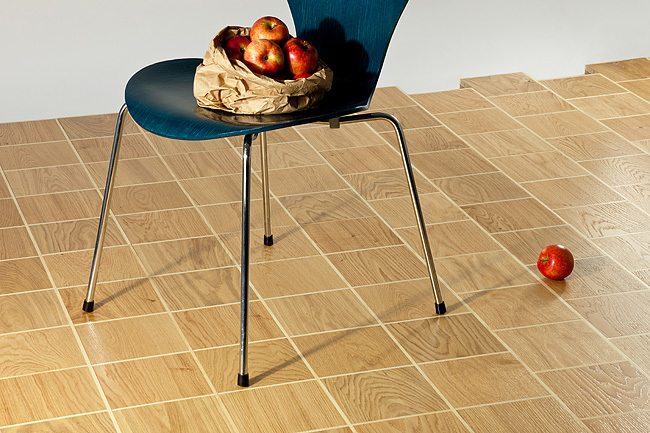 The very clear expression of the square makes it possible to expand the floor into a whole series of products in different variations of color range and wood species. Due to the size of the square, it is possible to extract 1-strip board material more efficiently, by taking out squares in parts of the wood that may otherwise go to waste in the 1-strip board production. inside that is golden – in your uttermost personal opinion! The drawer is hidden to keep intruders in wonder, unabled to access the content of the mystic cabinet. Curtains fall, drawers keep, a chair is a chair – this is whatever you want it to be! 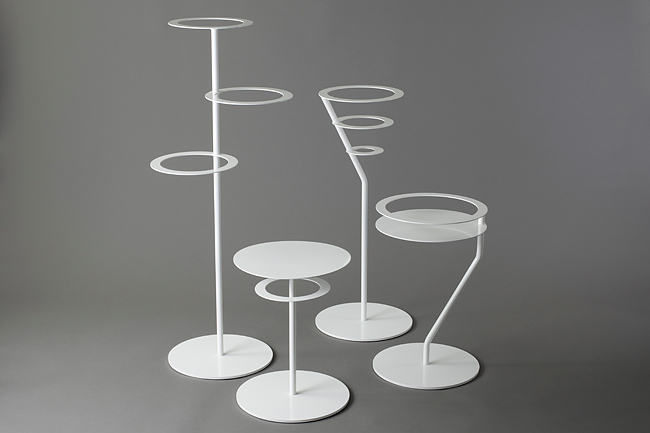 the form was set by circles and the user decides the furnitures purpose like dress hanger, cocktail table, flower pot-rack, hat stand, plant table, champagne holder, bookshelf, flower stand, bedside table, torch stand, coffee table... hold baskets or whatever! The school environment can be a pretty edgy and sometimes hard on many children and youths. Therefore, my most important thought that set the basis for the design of the chair series was for it to transmit a feeling of softness. I wanted the chair to be perceived as kind and be free from any hard edges. easily lift the chair on and off benches, and also stacking the chairs. 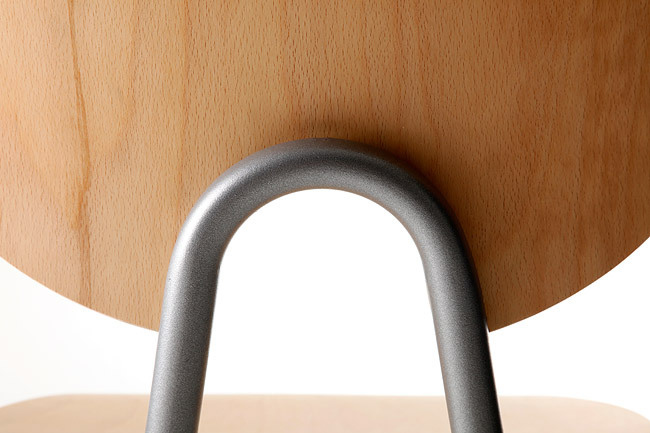 Hence the form of the backrest that becomes a handle together with the steel tube on it's backside. The school chairs' seat and back holds the series together – with their characteristic look – as it expands. The chair is available in the seating heights 45, 55 and 65 cm. The level difference occurs at the parallel straight lines between floor and seat of the steel tube chassis. This easy-to-use design allows the adjustable footrest to be at a comfortable distance from the seat. Diploma work in design executed at the rail and bracket manufacturer Hyllteknik in Alvesta, Småland. Where I, as the first designer ever at the company, worked close to the management in the work of designing a new screen wall. 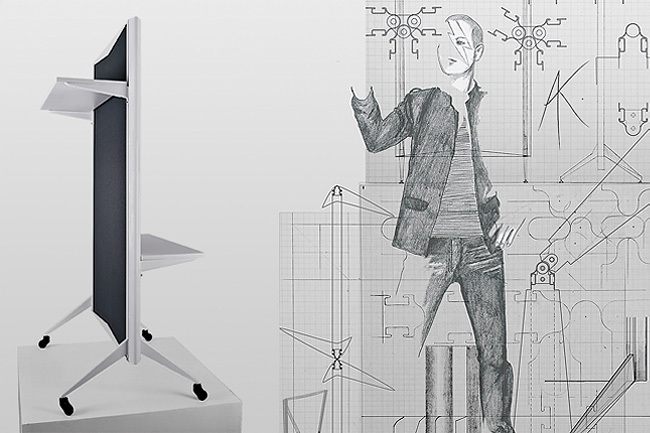 In the design process I focused on, and succeeded with, rationalizing the products manufacturing process and costs. the same product life cycle as recyclable PET-bottles. This material also has the highest class of sound absorption (Class A). Thanks to my design of the steel profile, the screen wall can connect stepless brackets and shelves, and also adjust the screen in height from the ground through it's legs or feet. My diploma work was honoured with scholarship from Sparbankstiftelsen Kronan. 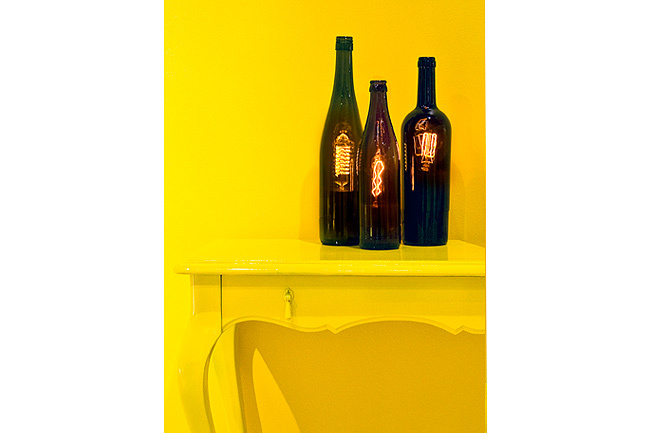 Flashklight (Swenglish wordplay) is a decor lighting made of recycled wine and beer bottles. The space of the bottles often holds a given task, to contain wine for example. When the task is served the bottles becomes useless for us and we throw them away, when they actually possesses beautiful forms that can be used further. Sustainable development is divided in three sections – environment, social and economic. With this project I concern all parts in different levels. The floor lamp Dou Li is the result of an advanced problem formulation, the more you know about the lamp's background the more it's design will appeal to you. Environment: I try to use as few different material as possible and with all raw material collected and refined in Sweden. The production would also take place in Sweden to reduce transport emissions. Social: the social plane also applies to keeping the full production cycle within the same country, not only because of transports but also for the country's and it's citizens welfare. Economic: the lamp is designed for low-energy bulbs and furthermore it's got a built in microprocessor connected to a sensor that together allows a energy efficient behaviour possible. Shortly; Dou Li works as the primary lighting in a room and can through the ball-handle "see" if there is a need to light up it's surrounding. If there is no person in the room it will lower it's energy use by slowly dim down the light and after a while turn off itself. If somebody reenters the room, Dou Li dims the light up again to the level set earlier. With Dou Li's advanced interior I wanted to use a simple exterior with a design based on the elementary forms. 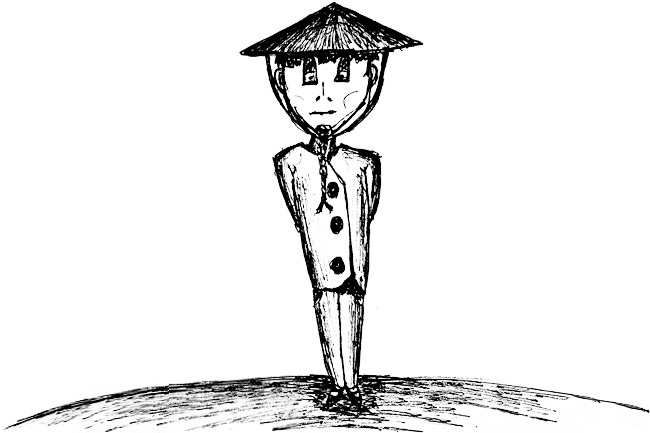 Which got it's inspiration from the caricature of a "chinaman" – as a reminder of all those mostly Asian people working hard for the western world's design. The name Dou Li comes from the traditional Chinese coned shaped hat, most often worn by farmers and workers of China. hormone and a higher capacity of obtaining knowledge. 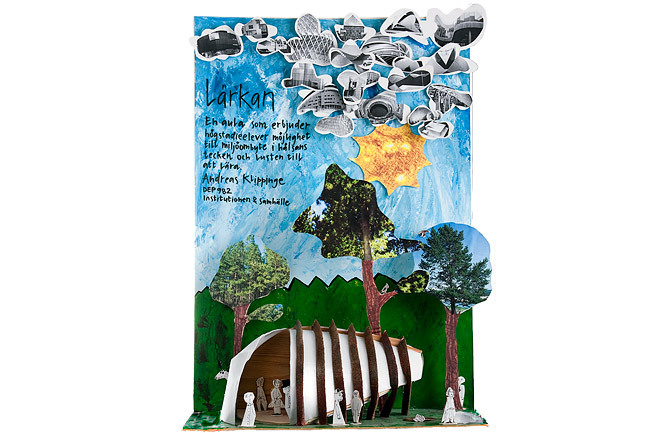 With Lärkan I want to offer junior and senior high schools a room of environmental change, for better health and the motivation to learn. The construction materials are free of maintenance and consists of untreated larch tree, copper and casted glass. The copper and larch represent the beauty of nature as they change in tone and colour as the years pass. 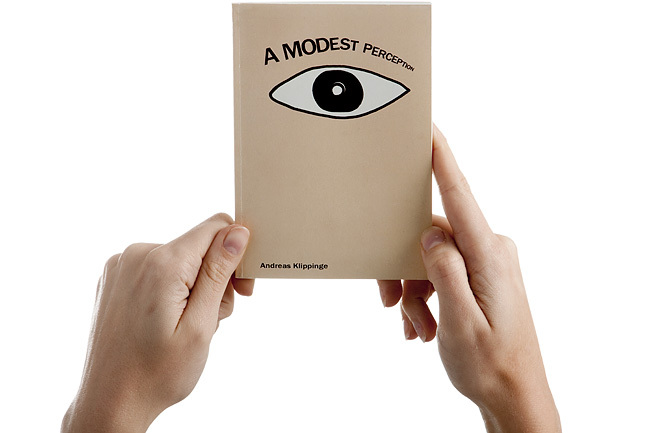 "A Modest Perception – for preventing the poor children of the street in the world from being a burden to their fellow citizens or country, and for making them beneficial to the public, and how they are viewed upon today." to the problem of homelessness and also reveal their own thoughts about homeless persons. Throughout the book I want to expose how homeless people are viewed upon by the society – hence come up with ideas how to make them useful to the society. For each page the reader (hopefully) will find what seems like harmless jokes become more and more cruel and at some point even disgusting. The candle holders is a result of a two day glass casting workshop. Glass beads were placed in my moulds and melted down in a glass oven. 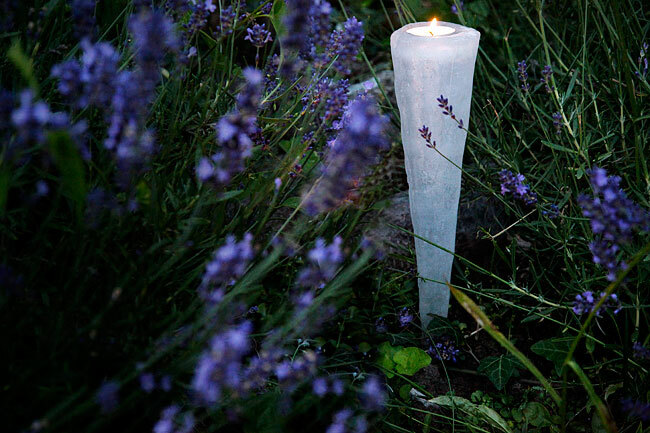 The result looks like icicles and can be used as garden lighting, simply by pressing down the thin edge in the soil.